There's a new website called FlipGloss.com that may change the way we look at fashion online: Flipgloss uses magazine-style, photo-driven spreads to present users with interactive, eye-catching content. Above, you'll see a glossy virtual mini-mag with 31 images featuring the latest spring collections at Target. Click on any item to find out how much it costs and where you can buy it. Warning: You're going to want EVERYTHING! I saw most of these items during my last trip to Tar-zhay, including the lovely homegoods, and it makes me want to just revamp my entire wardrobe and redecorate my whole house! And that Merona "Paddington" coat is quite possibly the cutest coat I've seen all spring. You'll also see new accessories from the just-launched Felix Ray for Target collection. Ooh-la-la! Check it out and let me know what you think of their format, Flipgloss will be looking for your feedback! Top: An authentic "Covered Giant Day" bag by Balenciaga. Bottom: Inspired-by bag at Mimi Boutique. Here's the short answer: As I understand it, handbags called inspired by or similars are legal. Personally, I think designer-inspired bags are thrifty and fab-u-lous! I photographed these knockoff Coach and Prada bags on the streets of New York City. They're everywhere. Handbags called replicas or copies suggest counterfeiting and are illegal. The people who sell these bags are trying to pass them off as the "real deal." Knockoffs, replicas or fakes will have fake name brand tags, logos, labels, etc. Inspired handbags will NOT. Personally, I don't see the point of buying a fake. There is way too much credible information linking the sale of fake designer handbags with terrorist organizations, child labor, etc. Not to mention, a $100 fake Coach purse ain't a great deal. They're also considered tacky by many, and are often poorly constructed. 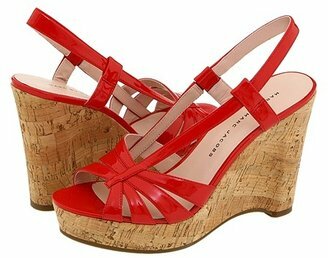 How adorable are these Marc by Marc Jacobs wedges? 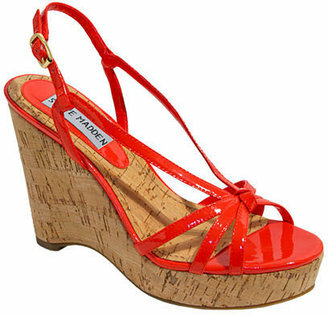 Available in either red, green, black or white, these sensational patent leather sandals with a cork heel will cost you $340 at Zappos.com. But we can do better than that, right ladies? Victoria's Secret to the rescue! These aren't patent leather like the designer originals, but they're also not $340. Available in harvest red, cocoa powder, putty or black, these Colin Stuart sandals are made from soft suede and carry a much more reasonable price tag of $59. Click any image for details! UPDATE: Blogger Anusha just dropped a comment with the following find from Steve Madden. I think it's a much better match and the price is better, too! 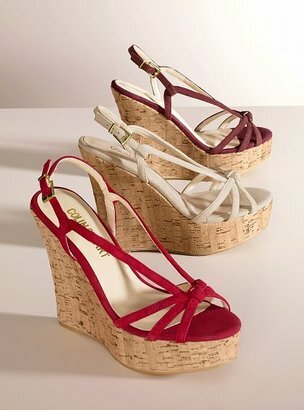 The "Vivaci" wedge sandal is available in white, black, gold or coral for $49.95. Thanks, Anusha!! Recently I checked out the new-ish I Heart Ronson by Charlotte Ronson collection at JCPenney, and I thought it was really cute! Everything was 30% off at the time, with sale prices ranging from $9.99 to $29.99. Very affordable. The quality is on par with Target or Old Navy, perhaps a smidgen better, and the designs have a lot of potential. I think this collection has pieces that would be suitable for women of all ages, but if I had a teenage daughter, I'd want her to wear this stuff rather than Fabulosity or Abbey Dawn. Make sense? For more prices and details on what's available online, check out the widget below.